A weird fact about me: I hate the grocery store, but I love the drugstore. I quickly find deals on little beauty essentials I need and I’m always excited to try out the new things I’ve bought when I leave. I had a mini splurge session at Walgreens the other day, and I can’t wait to tell you guys what I grabbed! Organix Moroccan Penetrating Argan Oil: This is the ONLY oil that works well with my extensions. Who knew it would be easier to find an oil that seals the end of your natural hair than it is to find one that makes your weave soft? I love this oil because it always brings my weave back to life: it makes it softer, easier to manage, and shinier without giving it an oily look. It even acts as a heat protectant! 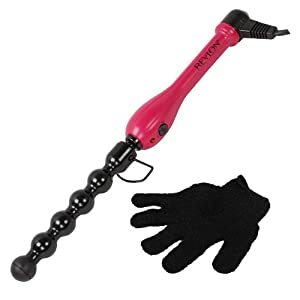 Revlon Curl Magic Curling Wand: I’ve been wanting to try out a curling wand for the longest, and I finally found one that is reasonably priced! I love the look of wand curled, shoulder length hair, so I cant wait to give this a try on my extensions! I also love the fact that this wand comes with a glove, and it has little grooves on it that will probably make wand curling a lot easier. Milani Color Statement Moisture Matte Lipstick in Matte Naked: I’ve been trying to find this lipstick for months ever since I saw “ItsMyRayeRaye” do a haul video for the entire matte Milani line. I could never find the ones I wanted (they were always sold out). When I realized they had Matte Naked, I had to grab it because it was the last one! Say Yes to Grapefruit Makeup Removal Wipes: Even though I don’t wear a lot of makeup on a daily basis, I always keep a large supply of makeup removal wipes around. It makes it way easier to remove tougher things like mascara or lip stains, and it’s way gentler on your skin. I used to be partial to the Neutrogena Makeup Removal Wipes, but I found that they leave me slightly oily and not as refreshed. In addition to that, you get more wipes with the Say Yes line. I usually go for Say Yes to Cucumber, but the Grapefruit included 60% more wipes! Score! Vaseline Lip Therapy in Rosy, for Soft Lips: I bought this on a whim, it was right by the counter and less than $2. I couldn’t resist, the packaging was so cute. I’m glad I bought it though. It comes in handy right after you’ve washed your face or right after you’ve taken a shower. I think it’ll be good to keep near your bed, instead of having to waste lipgloss to moisturize your lips in the middle of the night! We Want to Hear from You! What are your favorite things to grab from the drugstore? Is anyone else just as obsessed with the drugstore as I am? If so, tell me in the comments section below! Don’t’ forget to follow me on Instagram @IndiaWrites, Subscribe to my YouTube Channel, Youtube.com/IndiaVlogsHair, and check out my blog at www.thereddblogger.com!